Modern science and technology is pretty amazing really. MRI is a good example. It’s able to create good resolution pictures of the inside of my head, with no pain, just the discomfort of laying still in a noisy tube for an hour. I had my first MRI in February after seeing an ophthalmologist who was trying to determine the cause of my optic neuritis. I then needed another one after seeing my MS specialist neurologist in March. After my scan I got to take a CD home with my images on. It is a fascinating way to waste time in front of a computer screen! Here is a slice through the middle of my head, showing a typical picture of a brain in a skull (and is proof that I have one). Notice the scanner isn’t large enough to fit my big nose in! When I first saw this I immediately recognised my profile, especially as we’d done a profile family portrait a few years ago, so I had a play in Photoshop and merged the two together. Moving on to the reason for the MRI: on certain types of scans (there are lots – T1, T2, FLAIR, with or without contrast fluid, etc) inflammation in the white matter of the brain can show up as lighter or darker patches. A FLAIR scan (FLuid Attenuation Inversion Recovery) is very good at showing this. 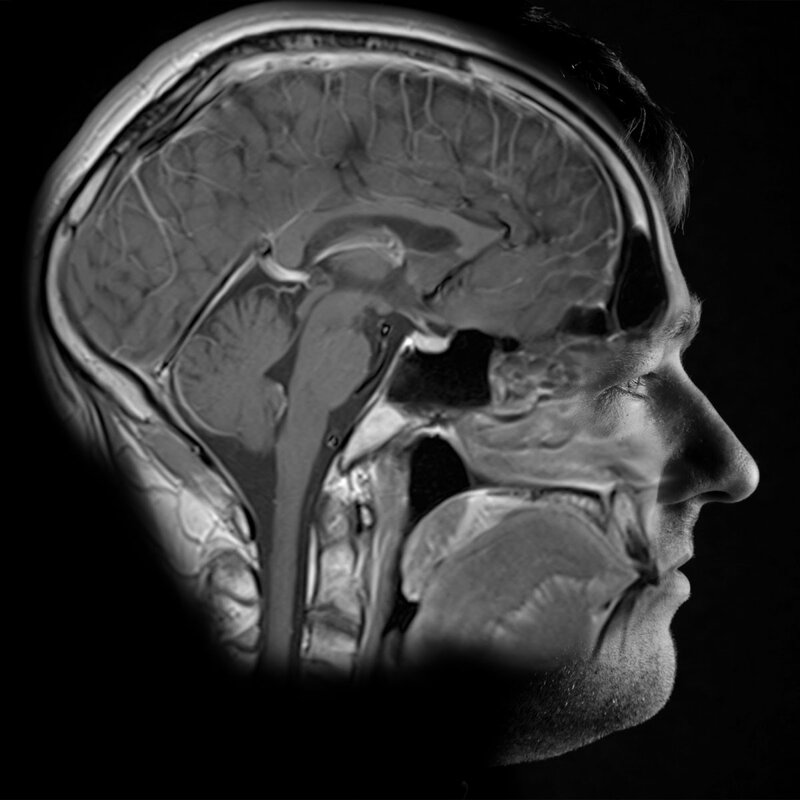 Here (Fig 1) is one from my first scan, note the (pretty obvious) pale area on one area of my brain on the left of the picture (actually the right side of my brain). After the second scan, as you can imagine, I was quite eager to compare my images when I got home. They didn’t quite line up exactly side by side but it was quite clear that some patches had gone and some were new. Here (Fig 2) you can see a pretty good comparison. The scans are 40 days apart. The earlier scan on the left shows inflammation around the ventricles running through the middle of my brain. The later scan on the right shows that these are reduced but also an area on the left of the image which is new. Not everyone gets further MRI scans after they’ve been diagnosed, but some neurologists think we should have them at least annually, to check on disease activity. Personally, I’m very keen on having MRIs regularly in the future. It’s a very good diagnostic tool, non-intrusive and safe. I can understand that it’s an expensive tool but the results and understanding are only getting better. When I had my first neurology appointment my neurologist showed me lots of areas of inflammation but explained that they could be in quiet areas of the brain. It is this kind of unknown and unseen that the MRI is great for. This story is part of the November 2016 issue of our free quarterly newsletter Open Door. Sign up for your free subscription!